Dicom3 Standard - 2007 provided by ARC NEMA as pdf files. 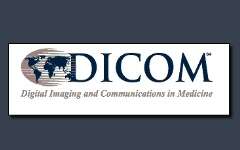 Dicom information resources including introductory material, presentations, explanations and official ARC NEMA web site. Picture Archive and Communication Systems (PACS) providing input modalities, DICOM server, PACS server, Archive server, Web server, RIS (Radiology Information Server) interface computer, and Radiology clients.